In the medieval and early modern worlds, ritual served as a legitimising process, a dynamic mechanism for mediating a transference or transformation of status. Objects played an essential part in this performative practice, charged with symbolism and invested with power. Distanced from their original contexts, however, these artefacts have often been studied for their material properties, disconnecting function from form and erasing layers of meaning. The relationships between ritual objects and ritual participants were identity-forming, reflecting and shaping belief structures. Understanding of how these objects were experienced as well as viewed, is key to revealing their significances. This panel intends to relocate ritual objects at the centre of both religious and secular ceremonies, interrogating how they served as both signifiers and agents of change. The organisers specialise in early modern British art and medieval Japanese art, and so we invite proposals from a range of geographical perspectives, in order to investigate this subject from a cross-cultural perspective. We particularly encourage papers which discuss medieval and early modern ritual objects—broadly defined —as social mediators. How to apply: Please email your paper proposal direct to the session convenors, details above. Provide a title and abstract (250 words maximum) for a 25-minute paper, your name and institutional affiliation (if any). This entry was posted in Call for Papers, Uncategorized and tagged AAH conference, arefacts, audience, brighton, British Art, early modern, embodiment, emotional objects, emotions, everyday, Function, illusion, imagination, interaction, Japanese Art, medieval, memory, objects, performativeity, Ritual, ritual object, social mediator, spatiality, symbolism, Temporality, thing theory on September 22, 2018 by costanzabeltrami. How to attend: A limited number of places are available for this conference. To register your interest in attending, please email Carole Sterckx (sterckx(ghi)ghil.ac.uk) by 1 November stating your affiliation and reason for attending. This entry was posted in Conference, Uncategorized and tagged accountability, bureaucracy, community, Conference, europe, government, interaction, officer, pre-modern, relations on November 1, 2017 by costanzabeltrami. This thematic issue of the journal Convivium is dedicated to the Italian South from the 5th to the 15th century. It seeks papers that engage with the specific transcultural dynamics of a geographical and historical area containing highly diverse political, social, and religious entities, as well as with the multi-layered connectivities that can be traced in the Italian South, across the Mediterranean, and beyond. We invite contributions from Art History, Archaeology, History, Anthropology, Paleography, and related disciplines that deal with the cultural diversity of Late Antique and medieval Southern Italy with special attention to sites, monuments, landscapes, images, and objects, as well as to the visual and aesthetic spheres in general. We are primarily interested in exploring horizontal and vertical dynamics, in terms of time (synchronicity/diachronicity) and space (global/Mediterranean/local scales). Papers with a theoretical and historiographical approach are particularly welcome. Proposals of max. 1 page should be sent by 20​ ​September 2017 to the editors: escirocco@gmail.com and dirwolf@khi.fi.it. The deadline for the submission of articles is 30 November 2017. Convivium V/1 will be published in March 2018. Contributions (30,000-40,000 characters including spaces, and up to 15 full-color illustrations) must be sent by 30 November 2017 to Karolina Foletti, executive editor of the journal: karolina.foletti@gmail.com. Languages accepted: English, French, German, Italian. Each article will be evaluated through a double-blind peer-review process. This entry was posted in Call for Journal Submissions, Uncategorized and tagged Antiquity, artistic exchange, Convivium, exchange, global, historiography, interaction, interdisciplinary, Italian south, Italy, journal, mediterranean, migration, religious interaction, Ritual, sacred space, southern Italian, Southern Italy, transcultural, transregional on September 5, 2017 by costanzabeltrami. Call for Sessions: Mary Jaharis Center Sponsored Panel at the 4th Forum Medieval Art, Berlin and Brandenburg, September 20–23, 2017. The Mary Jaharis Center for Byzantine Art and Culture seeks proposals for a Mary Jaharis Center sponsored session at the 4th Forum Medieval Art, Berlin and Brandenburg, September 20–23, 2017. The biannual colloquium is organized by the Deutsche Verein für Kunstwissenschaft e.V. The theme for the 4th Forum Medieval Art is 360° – Places, Boundaries, Global Perspectives. It will focus on research at the geographical and methodological boundaries of classical medieval studies. The various venues in Berlin and Brandenburg with their medieval heritage and their rich collections of Byzantine and Middle Eastern will be taken as a starting point. Accordingly, the conference will highlight the interaction of Central European medieval art and artistic production with other regions ranging from Eastern Europe, Byzantium, the Middle East, the Caucasus and the Mediterranean to the British Isles and the Baltic region. Thus research areas such as Byzantine Studies or Islamic Art History will be brought into the focus and consciousness of medieval studies, particularly in the context of the endangered artistic and architectural monuments of the Middle East. Especially welcome are topics discussing phenomena such as migration, media transformation and changing cultural paradigms. By asking for culturally formative regions at the borders of “Europe” and transcultural contact zones, definitions of the Middle Ages can be put up for debate. As a counterpart to this panorama, research about the region of Brandenburg and Berlin will also be presented. This includes subjects of museum studies and the history of art of and in Berlin, where the development of areas of cultural exchange has a long tradition. We invite session proposals that fit within the 360° – Places, Boundaries, Global Perspectives theme and are relevant to Byzantine studies. Applicants will be notified of the status of their proposal by May 16, 2016. The organizer of the selected session is responsible for submitting the session proposal to the Forum by June 1, 2016. If the proposed session is approved, the Mary Jaharis Center will reimburse session participants (presenters and chair) up to $300 maximum for residents of Germany, up to $600 maximum for EU residents, and up to $1200 maximum for those coming from outside Europe. Funding is through reimbursement only; advance funding cannot be provided. Eligible expenses include conference registration, transportation, and food and lodging. Receipts are required for reimbursement. This entry was posted in Call for conference session papers, Uncategorized and tagged 4th Forum Medieval Art, byzantine, byzantium, contact, interaction, Mary Jaharis Center for Byzantine Art and Culture, transcultural on April 28, 2016 by costanzabeltrami. Convivium restarts and continues the glorious Seminarium Kondakovianum, the journal of the institute founded in memory of Nikodim Kondakov in 1927, which represented the desire to maintain and deepen Kondakov’s pioneering scholarly work in Byzantine and medieval studies, celebrated not only in the Russian and Czech worlds but also in western Europe. Convivium covers an extended chronological range, from the Early Christian period until the end of the Middle Ages, which in central Europe lasted well beyond the Renaissance in Italy. Equally vast is the range of subjects it will treat. Whereas its central concern remains art history, that is, whatever pertains to images, monuments, the forms of visual and aesthetic experience, it is also open to many disciplines tied to art history in the deepest sense: anthropology, liturgy, archaeology, historiography and, obviously, history itself. The goal is to ensure that the journal will provide a 360o opening onto the field and the research methods being deployed in it. Two numbers of the journal will be issued every year; all articles will be approved by a blind peer-review process. The first will focus on a theme, and the second will be a miscellany. Each issue will comprise five to ten articles (in French, English, Italian, or German), between 40,000 and 60,000 strokes long and fifteen illustrations (some in color). 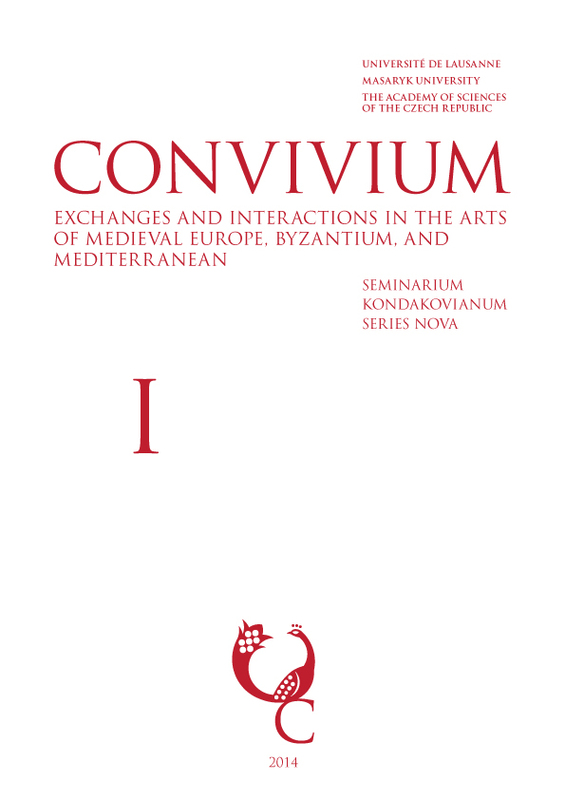 Convivium will be published in paper and digital format and distributed by Brepols. To submit an article, contact : convivium@earlymedievalstudies.com. 2015: The Three Romes (Rome, Constantinople, Moscow). Studies in Honour of Hans Belting. 2016: Facing and Forming the Tradition. Illustrated Texts on the Way from Late Antiquity until the Romanesque Time. 2017: Inventing the Past: Medieval Studies as a Virtual Construction. 2018: Multicultural Spaces in Southern Italy. This entry was posted in Call for Journal Submissions, Publications, Uncategorized and tagged art history journal, Byzantine Art, call for authors, call for journal submissions, Convivium, Cultural exchange, interaction, medieval Europe, Medieval Mediterranean, Nikodim Kondakov, Seminarium Kondakovianum on July 31, 2014 by michaelazoeschg.